Praz Bansi won his second Grosvenor United Kingdom Poker Tour Main Event yesterday, at the Victoria Casino in London, and walked away with a winners cheque for £101,020. He won his first title back in 2007 at the original event held in Bolton. Bansi entered the final table with a commanding 1.28Million in chips, some 400,000 more than his nearest rival Gary Lindsay, who himself had nearly double the amount of third placed Chris Kyriacou with 412,000. Lindsay eventually finished in third place and collected £44,100, while Kyriacou could only manage seventh and a cheque for £12,500. Second place went to the German Manig Loeser who pocketed £67,070 for his weekends work. There were 245 players in the tournament altogether, which had a prize pool of £367,500. 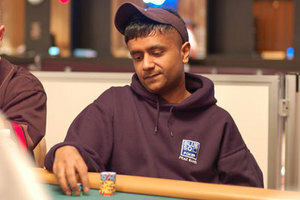 Bansi is a member of The Hit Squad, and was joined at the final table in London by fellow squad member Karl Mahrenholz, who was to finish fourth. Bansi is fast racking up the wins and collecting big cashes worldwide, and he is already a two time World Series of Poker Bracelet winner, with the second of those coming just last year when he won $515,000 in event five at the main event. He is never a player to go over the top with his celebrations and yesterday was no different, when commenting on his win he said that it was a pleasure to win his second GUKPT Main Event and that he had run well against his final table opponents. The next leg of the tour is in Walsall and you can qualify online with free satellites available all the way up to a £250 + £22 buy-in for a Sunday qualifier. The Sunday qualifiers offer four guaranteed seats to the Main Event, so what are you waiting for. This entry was posted on Monday, March 21st, 2011 at 12:14 pm and is filed under Poker News. You can follow any responses to this entry through the RSS 2.0 feed. You can leave a response, or trackback from your own site.